Located in Goslar Rural District, this hotel is within 1 mi (2 km) of Goslarer Rathaus and Marktkirche St. Cosmas und Damian. Goslar Imperial Palace and Museum und Besucherbergwerk Rammelsberg are also within 3 mi (5 km). Goslar Station is 16 minutes by foot. How Much is a Hotel Room in Goslar? Hotels in Goslar start at $71 per night. Prices and availability subject to change. Additional terms may apply. Are you dreaming about traveling to Harz? Looking to find somewhere to put your feet up? Travelocity features many excellent options. Modern travelers using Travelocity can dream about booking about 17 outstanding accommodations within a 6-mile (10-kilometer) distance of the downtown area. 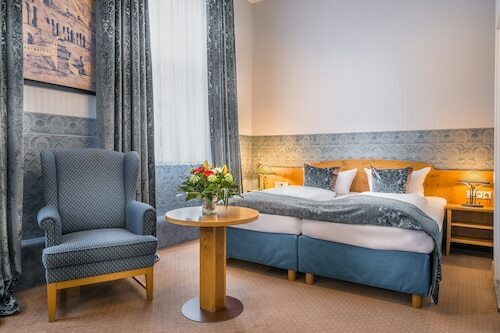 Goslar offers travelers a number of handy Travelocity-listed rooms, including the Altstadt Hotel Gosequell and Hotel Die Tanne. 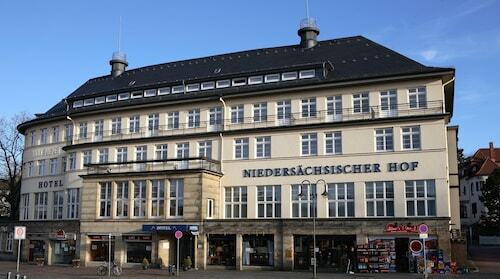 Budget hotels within the Goslar region include Hotel Der Achtermann, Hotel Die Tanne and Hotel Niedersaechsischer Hof. 12 miles (19 kilometers) away from the main part of Goslar, you can find the Landhaus Zu den Rothen Forellen. The Rilano 24 7 Hotel Wolfenbüttel is about 18 miles (29 kilometers) away. 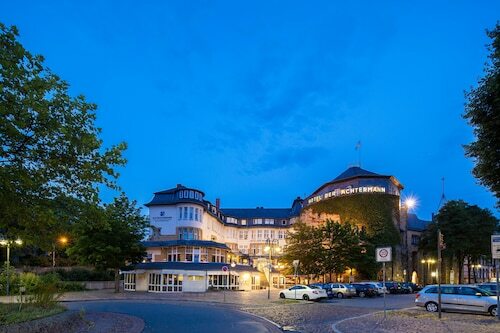 The Maritim Berghotel Braunlage and the Braunschweiger Hof are two other recommended hotel options around Goslar. If time is on your side, why not get to know the other sights of Saxony-Anhalt while you're in this area? Investigate Saxony-Anhalt's castles and admire the region's forests, rivers and streams. In this corner of Germany visitors might also try their hand at snowboarding. Are you looking for activities? You could spend a few hours exploring Grenzlandschaft and Museum Sorge and Ring der Erinnerung, in Sorge, 19 miles (31 kilometers) southeast of Goslar. Some of our recommended Sorge hotel options include the Hotel Tannenpark and Landhausferienwohnungen Am Brockenblick. Or stay in Thale, 30 miles (46 kilometers) southeast of Goslar, where you have the options of the Harz Resort Waldesruh and AKZENT Berghotel Rosstrappe. The Rosstrappe and Teufelsmauer Nature Park are some of the more popular attractions to experience in Thale. When cheering on sport is your passion, don't overlook a visit to HDI Arena, which is located 45 miles (69 kilometers) to the northwest of Goslar. Sports fans wishing to find a hotel close by will love the Cityhotel Königsstraße or the Sheraton Hanover Pelikan Hotel. Hannover Airport is a primary entry point for those flying in and out of Goslar. It can be found 50 miles (79 kilometers) from downtown. If you would like to find a base nearby, enquire about Leonardo Hotel Hannover Airport or Maritim Airport Hotel.